This week only, MeldaProduction offers their MPowerSynth, MFreeformEqualizer, MAutoEqualizer and MMultiBandPhaser plugins at half price. SPL presents the PQ Mastering Equalizer, a fully parametric, dual-channel, five-band equalizer. Thermionic has announced a new 19" stereo tube EQ, and as usual with the British brand it will sport a bird-inspired name: the Swift. To celebrate the company's 10th anniversary, Elysia releases commemorative editions of their four 500 modules. 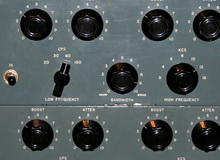 BAE announces the availability of a new EQ module in API 500 format inspired by the classic 312 circuit, the B15. Warm Audio is at Musikmesse where they are showing their clone of the legendary Pultec EQP-1A tube equalizer. Apora is a new UK company that debuted at NAMM this year to introduce two hybrid processors for the studio.